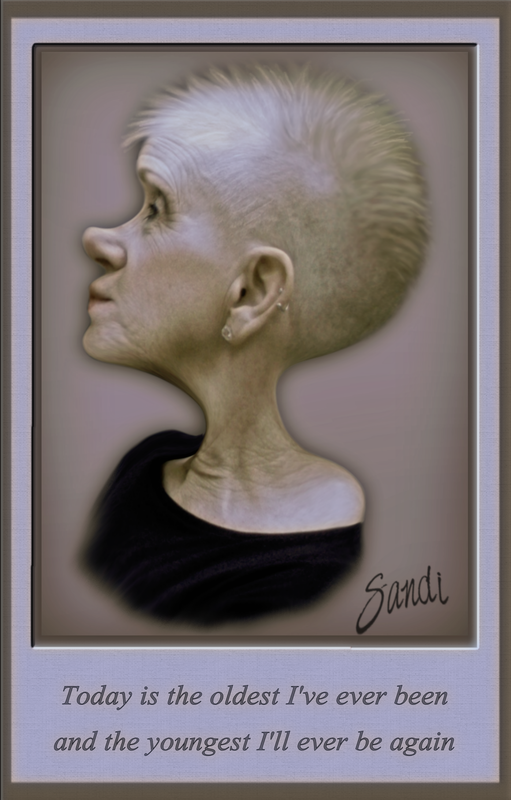 My mother would tell me, “Don’t get old, Sandi. It’s not any fun.” And as usual, I didn’t listen to her. So here I am. I look in the mirror and don’t know who the heck that old woman is or what she did with my red hair and freckles. She was so sneaky about it too, sprinkling a few grey hairs here, lots of wrinkles there, and a bunch of other stuff I’d rather not talk about. But I thank God every day that He has allowed me to hang around this long, and that no matter how scary old age is, He promises to walk with me every step of the way, to calm my fears, and to love and protect me from harm. And when I take my last breath on this earth, He will take me to my eternal home in Heaven where old age is not allowed! In that, I find hope, peace and comfort.